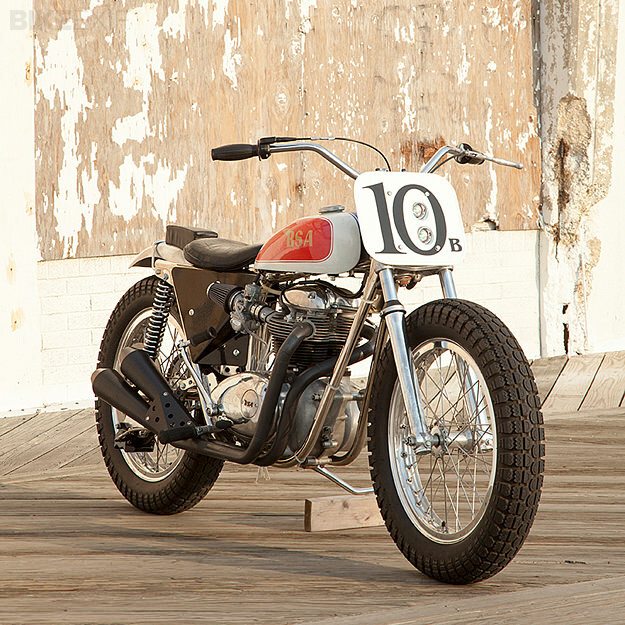 If there’s a growing trend in custom motorcycles today, it’s towards street trackers: road-legal versions of the flat track bikes that raced in the 1960s and 1970s. 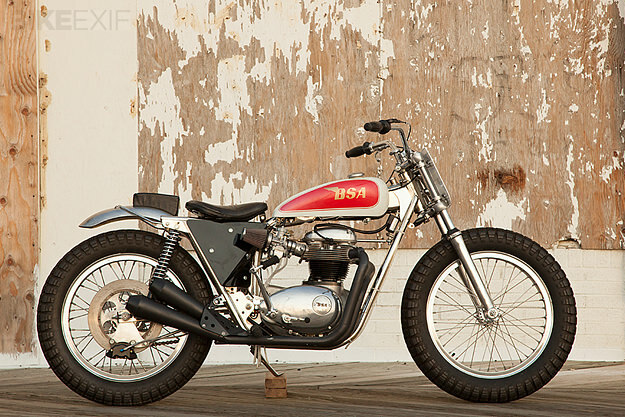 With small tanks, wide bars and fat tires, they’re good-looking bikes stripped down to the essentials. With help from Bradshaw and Rick Stone over the next couple of years, Phil managed to source a Trackmaster racing frame, a Bates seat, and Ceriani forks (including triple trees). He also located authentic tires, Borrani rims, Kennedy quick-change hubs with knockoffs and, best of all, an original fiberglass gas tank with intact paint. 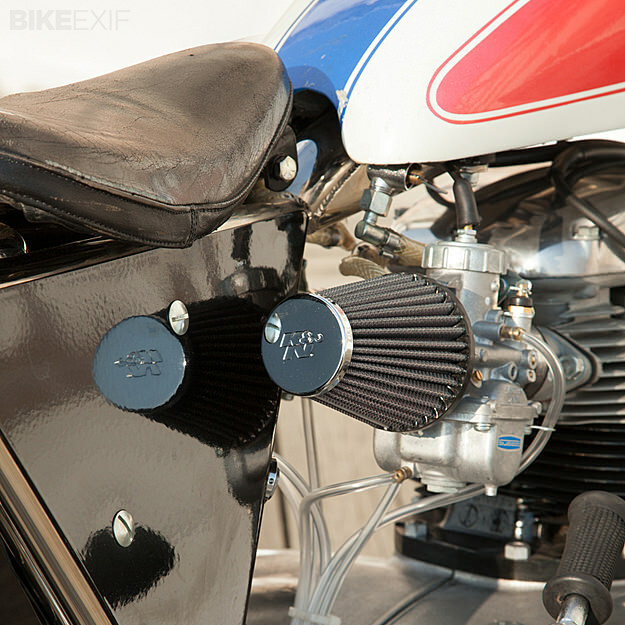 For extra power, Dave installed an original Spitfire cam and new Mikuni VM roundslide carbs, duplicating those used on the original BSA race motors. For dependability he used a Bob Newby Racing billet clutch assembly/belt drive, a Boyer electrical system with a high output alternator, and a li-ion battery. 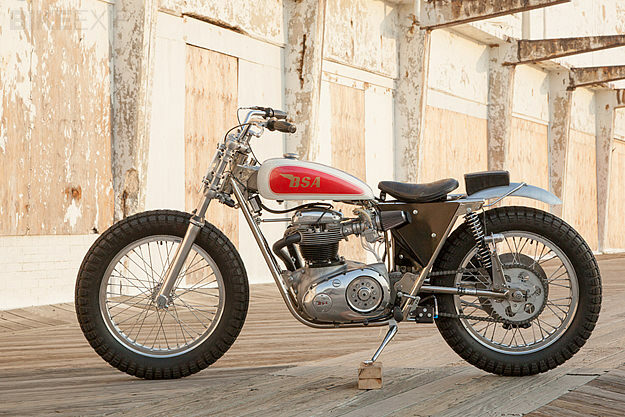 “The two sets of original pipes I had were beyond repair,” Phil reports, “so Dave handcrafted new megaphone pipes that mimick the originals.” To keep it in the family, Dave’s son fabricated the new rear fender. The frame needed considerable work. The original swing arm was lost and the Trackmaster replacement needed extensive remedial work. Fatigue cracks and ugly welds from back in the day were cleaned up, new tabs were added, and the complete frame was nickel-plated once again. For stopping control, a new Wilwood brake caliper and master cylinder were used—at the rear wheel only, in true flat track fashion. 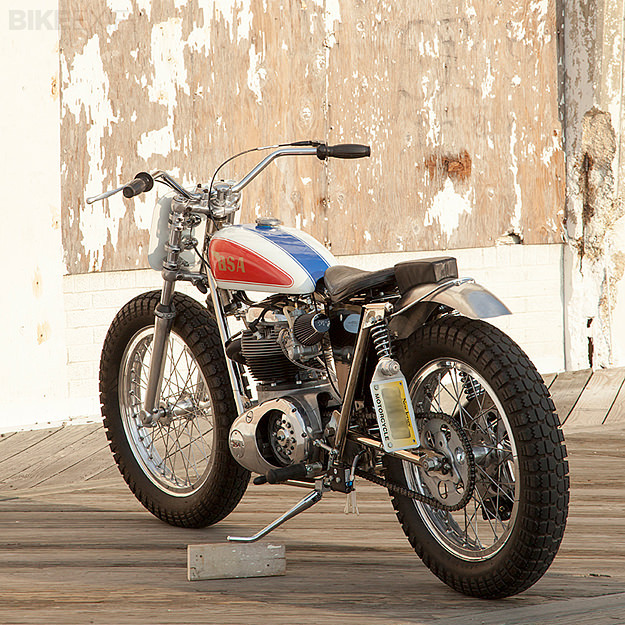 “Dave also used his last ‘new’ original Amal throttle to make this bike do what it’s made to do—Go!” says Phil. Photography (c) 2013 Erik Landsberg.